Video: Can an egg choose the sperm it likes best? Female comb jellies have a problem: how do you pick the best father for your children when you release your eggs directly into the water? It takes a lot of time and energy to make an egg, and for this reason many female animals are quite picky about their mates. Because of the way comb jellies reproduce, a female can’t choose whose sperm will fertilize her eggs. Instead, lady comb jellies have developed a trick that’s even more sublet. They have very clever eggs. 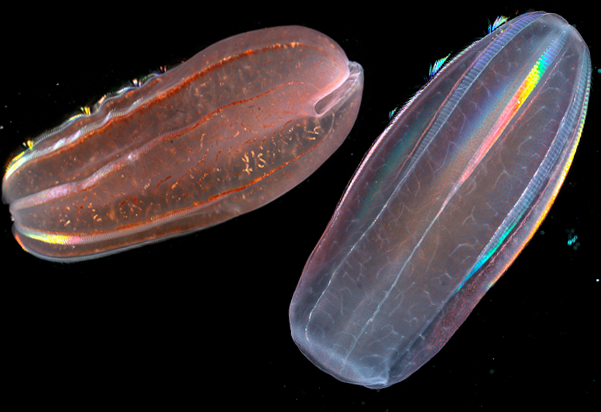 Comb jelly eggs do something that, in most critters, would be downright disastrous– multiple sperm are allowed to enter a single egg. In humans, this is catastrophic, causing the egg to spasm and collaps. But for female comb jellies, this is where the selection of a suitable partner really begins. The female half of the DNA, packed in a tight little bundle termed the “female pronucleus”, wanders from one sperm to the next, sizing up each potential match . Through this process the female pronucleus somehow determines which sperm is in fact the “best”, and the two halves fuse. Video caption: We’re looking at the surface of the egg, each bright stationary dot is a sperm. The moving particule is the female pronucleus, as it bounces from one sperm to the next. Once the male and female pronuclei fuse, the first cell devision begins. This fusion kicks off development, including the first cell devision. All this incredible female behavior and choosiness is happening at the sub-cellular level. What the female pronucleus is choosing, and why, are as yet more unexplored aspects of jelly biology. This is common with in vitro attempts of broadcast spawning marine inverts… have they since determined if we know this is natural behavior in the wild and not an effect of in vitro fert?